I had always thought that my life experience at Ball State University– where I have my undergraduate degree in journalism from– was much more defining of my life than my two graduate degrees from the University of New Mexico– a masters in health education and a doctorate in family studies. However, over the past three weeks I began to realize might not be true. While I will never downplay my experience at Ball State because I had so many opportunities and then because it was where I was going to school when my sister Denise died by suicide, what I have failed to acknowledge over the years– simply because I didn’t realize the importance of it– was that going to UNM changed my life in many ways. I came to Albuquerque as a 22 year old in August 1994 whose sister had died just eighteen months before. I moved here because I knew I wasn’t supposed to live in the Midwest for the rest of my life and graduate school was the perfect way to escape (not that I realized it in those exact words at the time). I also forced myself to start over in a new place with new people and new experiences. And I relished experiencing a climate and culture unlike any other and one that I’ve been able to share with others. Somewhere along the line though, I had a chance to spend more time back in Illinois and embraced the idea of a second home in my hometown with the blessing of my first husband. But after a divorce and spending a year and half there, I realized it wasn’t where I was supposed to be and longed for the clear skies and the open mesas of New Mexico. I had thought life had sent me to New Mexico to heal from my loss, but I then began to see it was much more than that. There was a piece of my soul that belonged here, something spiritual, something I needed for who I am supposed to be. It was during those few months where I awaited the move back to Albuquerque that I talked to a priest I had known since before my sister died. No longer at Ball State but still at the area, I met up with Fr. Dave whenever I was in Muncie and he always said something wise and profound as we spent several hours together catching up. That time he told me that he was surprised that I had moved back to Illinois because, essentially, I had spent my entire adult life in New Mexico. I was struck by this– how true it was– when I look at the influences on my life (right down to my cooking style) because of living in Albuquerque. 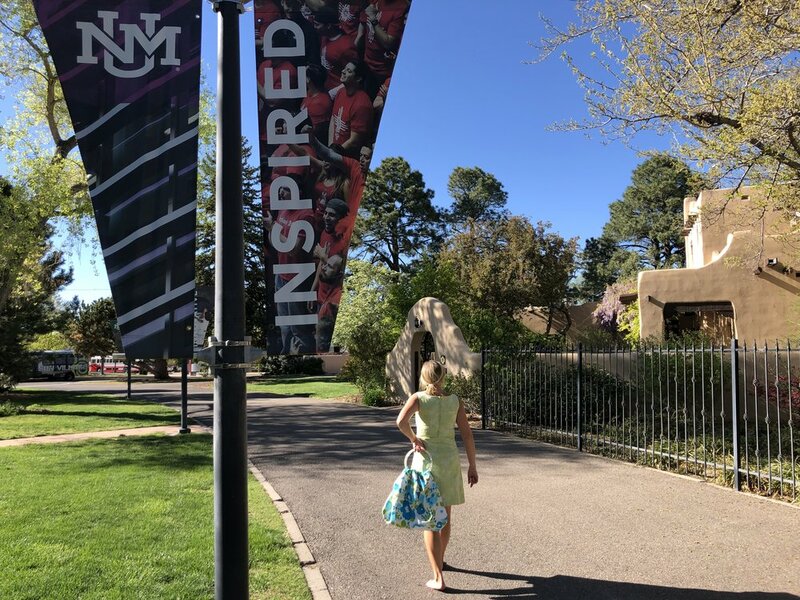 While life to takes me to Los Angeles– but not nearly as often as I would like– the place I call my “other home” and I tell people I am originally from the Midwest, I am who I am in many ways because of Albuquerque and that’s why this is home. I wrote several weeks ago about how we didn’t get to take our spring break Los Angeles trip and that it worked out because the universe kept sending us signs that we needed to stay home. Both Greg and I were able to accomplish some things that week that allowed us to get ahead (the swamp coolers for Greg– a spring rite of passage here in New Mexico). However, last week I began to realize the one downfall of us not taking the trip– that I didn’t hit the reset button hard enough in my life. I tried to change up the routine that week– I didn’t have the house cleaned, we skipped church, and I didn’t set my watch to time my morning workouts. I realize some of these things might seem small or things that many people don’t do but, for me, they are part of my daily life and they are important to me. By the end of last week rolled around though, I realized I was feeling exhausted and a little burned out. When we go to LA I am completely forced out of my routine: there are no dogs to run, no pool to swim in (the ocean is not so warm in the winter! ), no sewing machine to use. I sleep in (which is past 5:00 am for me), I only get in one workout and it’s mostly a long walk with Greg, I eat a lot of Cheez-Its that Sam knows I’m addicted to and don’t buy at home, and I catch up on my reading. But being at home, it was too easy to keep doing most of these things and I hadn’t realized how important that week off from my routine is to keeping myself fresh and motivated. I also realize that I am not a staycation kind of person– it’s too easy for me to continue with my routine if I’m not far enough away from the parts of it that make it happen (pool, sewing machine, running and walking the dogs). I tend to live a very structured life and much of that is because I have goals I want to accomplish. I will never be an overnight sensation because I’ve been working too long to get to where I want to go. Instead, I have to block out time nearly daily for the aspects of my life– the ones that make me happy– that I want to do. However, I’ve also realized that maybe every month or so I need to crack the routine enough to keep me fresh. There’s a lesson in everything. If we choose to be open to learning what it is. I never thought of exercise as something spiritual. For a long time in my life, it was a physical activity that I also knew benefited me emotionally. I have written previously about how I pray during my initial run in the morning– with Lilly my German Shepherd– where I say thanks for everything in life from the previous day. However, as I reflect back on my life and how much swimming has become an integral part of my daily life, I see now how that’s more spiritual time, zen time. I usually swim later in the day, if possible, so that I give myself a break from my work. Although I did find this winter that 11:00 am gave me a good break from my morning work at my laptop and what I tried to make afternoon work at the sewing machine. And after writing throughout the morning, I also used that time in the pool to plan my writing for the following day. Prayer isn’t easy- my mind wanders and if there is any noise (particularly at the gym pool), I find myself getting caught up in what’s happening there. I also have learned that half of prayer is learning to shut out the outside noise and not just let my mind rest from whatever else I’ve been doing, but also see what ideas come into my mind by being open, by giving it a rest. I usually leave the pool feeling at least mentally rested and ready to tackle the rest of the day. The bonus is that I usually have at least one writing idea that goes home with me. Running has always served a purpose in my life- as does walking the dogs– but swimming has become something different. It’s as if it has an added component from getting off my feet and working my way through the water, giving me a different perspective and a different place to open my mind. I have written before about the importance– to me– of running and walking at sunrise, about how it has gotten me through some very dark times in my life. And how I learned of its importance– long after I was doing it and feeling solace in it– from a Navajo man who told me that they believe in greeting the day with their steps, with a run. I get up at 4:00 am and I realize that most people find that nutty and believe that I jump out of bed to start the day. Not so. I pretty much roll myself out of bed and over the last month I have stumbled to my office (and somehow manage function sitting on my ball) to write two pages before I leave for my workout. Recently, I was finishing up the last part of my workout with a loop around the park by my house, Hattie and Ash in tow, when we ran into one of the other regulars. We always note the weather and how lucky we are to be outside as darkness becomes light, as the day begins, as if overnight God wiped the chalkboard clean and washed the streets down. She and I always talk about how beautiful the mornings are, the outline of the Sandia Mountains taking place to the east of us as light starts to emerge. With another friend, we are always certain to look up at the moon and the stars– and whatever planets we can see in our usually clear morning skies. This morning the moon was low in the sky, but a sliver and reminder of how the sky changes daily while the earth rotates and seasons change, time passes. On this morning, I happened to say, “I much prefer sunrise over sunset” and she agreed. Then I added, “I hate to get up, but I love to be up at this time of day.” She also agreed. I know sunset for many people is the reward for a long day of work, life, whatever. Sunset is the end of the day, a way to cap off everything that’s happened before slipping off to rest and sleep. But for me, I need sunrise much more. I need to be reminded in the morning of the hope of what’s to come, the belief of all that’s ahead of me, of knowing whatever happened the day before there’s a chance to start over. With a clean slate. At some point in my life, I made a decision about certain goals and dreams that I wanted to accomplish. When I did that, I also realized that there would be many uphill battles. But now that I’m older– and this is really hard– I’ve also learned that there are times when the universe is sending me messages that I really should pay attention to even though they aren’t what I want to hear. One of my favorite places I love to go to, and I’ve written before about how important it is in my life and who I am, is Los Angeles. It’s my second home because we travel there multiple times a year. And each time as we get closer to leaving, I find myself at the church we attend there lighting a candle and thanking God for the week. It’s during that time that I begin to reflect back on my experiences there and I see how nourished and energized I feel from, well, being there. It’s like LA gives something to my soul that I don’t get in most other places, enough to keep me going until my next visit. Except that we’re supposed to be there this week. And we’re not. Without going into all the mundane details, there have been signs all over the place that we weren’t supposed to make this trip. I kept fighting them, believing they were just roadblocks I had to find a way around. But finally last Wednesday I felt exhausted at the thought of packing and having to endure more roadblocks on the trip. I decided it wasn’t worth it and we began to think we’d stay home. However, the door was still slightly ajar when on Saturday morning, Ash got really sick and we had to take him to the ER vet. While the results were inconclusive at the time, now I see he has colitis (just one round of antibiotics had his body acting more friendly toward anything he ate) and I knew then we had to shut the door on the trip. I am bummed out because I know we won’t make it there until late June– even though I realize the ocean and everything important to us isn’t going anywhere. At the same time, I know the signs were telling me that even though it feels like two steps backward, as I go forward in the days and weeks ahead, I’ll see it was actually more than two steps forward. The hardest part isn’t just listening to the message, but actually following through with what it says. And trusting that it’s the right decision. Much like life itself. As I write this, it’s the 26th anniversary of my sister Denise’s suicide. However, you won’t read this until tomorrow because I’m not posting it on social media until then. I have said in the past that I don’t want to acknowledge her death date anymore and I really don’t which is why I’m waiting another day. But there’s also another reason– I don’t want anyone to feel sorry for me. It’s been 26 years. It’s more than half my life ago since she died and I’ve had plenty of time to examine it, spin it around, turn it upside down, and realize that I can’t change her choice or what happened. What I can control is my life and right now I feel like life has bigger things for me, that I haven’t tapped my potential, and I want to get there. I don’t want to be lost in the aspects of my past that don’t keep me moving forward. However, no matter how much time and processing go by, the reality is that this date is always marked in my head. St. Patrick’s Day and the NCAA Tournament are reminders of events leading up to her death. And now we have the anniversary of Mom’s death a week after Denise’s. I wouldn’t say I’m sad today; too much time and processing has gone by for that. I can’t wonder about “what could have been,” because there’s been too much life since then. Mostly, I feel like when I went to Norway some years ago and saw a black and white photo on my friend’s wall of a teen in a football uniform. I hadn’t known she had a brother because he had been killed in Vietnam, before I was born. I realized as I stood there looking at his photo that I, too, would be like her one day with a dated photo of my sister because so much life would have passed. I’m there now. Denise is still part of my life, she is with me, just as my parents and the many others from my life who have died. But I still have much life to live and my focus is on that, not what could have been. I struggle through January and February each year, mostly because they are cold and wintry months– I’m done with snow and cold once the holidays have passed. When March 1 hits, I feel as if a cloud lifts off me, knowing that spring is around the corner, that while the desert spring winds might be coming, at least the nights won’t be so cold and the chances of getting snow are slimmer with each passing day. For that reason, I also try to work hard and keep busy in January and February, praying that I keep my nose to the grindstone. Yet the hardest part– as I’ve written before– is that with lofty goals, I don’t often see the progress of whatever I’m working on. Until my writing and creating are finished, whatever I’m working on remains still a piece of clay that hasn’t fully been formed into something. While I was happy for March to roll around, last week I suddenly felt as if I were on a game board, going round and round with the routine of life. And it wasn’t until the week ended that I had some feeling that there is more than routine right now in my life. Routine isn’t bad, especially because when life is in a state of upheaval, we crave it. Yet there is something to be said for being knocked out of it for a change of pace. A week ago Saturday, we sang “On Eagle’s Wings” after communion at mass. This is one of the songs that used to make me think of my younger sister– as it was played at her funeral– but now reminds me of Mom because it was Mom who selected it for Denise’s funeral. It had been a long time since I heard it and each time I do, I have such a sense of Mom being around me. After I left the estate sale, with a cool few things, but believing I missed more, I reminded myself that if I had gone earlier, I would have missed Mom and her being with me. What was there, was what I was supposed to take home. Then Saturday, yet again we sang “On Eagle’s Wings” after communion. I typically make a bathroom run after communion because we go out to dinner and, well, let’s just say the church bathrooms are much nicer than a lot of places. But on this day I didn’t think I would go to the bathroom as I didn’t want to miss any of the song. If I went to the bathroom, I’d miss that time with Mom. Something happened though– the line for communion was slow, probably because more people are at mass as we’ve now entered the Lenten season– and by the time I was ready to walk back to my seat, the song had ended and I was free to head to the bathroom. It was then that I realized what Mom was telling me– everything in its own time. I can worry, I can fret, I can believe I will miss my boat, and I can feel like the routine might not end and start to feel stale. No, she was saying, it’s all happening as it’s supposed to . The dominos will fall just right. Keep at it, it will come. When I went to see Fr. Gene on Friday for my monthly spiritual direction meeting at the Norbertine Monastery, he asked me what I was planning to do for Lent. I stumbled a bit, realizing that I’d been so caught up in what we were going to eat for dinner on Ash Wednesday (Greg is not as much a fish stick fan as I am– something we rarely eat outside of Lent at my house and it beats tuna casserole) and how I am going to make the 7:00 am Ash Wednesday mass. It took me a little while to realize that I actually had started my Lenten journey last week and now I feel as if I have tripped into Lent, after it feeling like it was still a month away. I always try to use Lent as a time to draw closer to God and one way I finally realized– after nearly my entire of life of not being aware of it– is that God and I seem to travel together with my writing. I have been asking God to bring me what I’m supposed to write and last week I felt as if I’d gotten knocked on the head with something. I don’t want to reveal more than that right now as I need to travel this journey before I understand more. But at this point I have a sense that some things are tying themselves together into one piece. At least after a lot of starts and stops on various things, I hope it’s the case. However, Fr. Gene also reminded me of something, that the more we pray, the more we are aware of everything around us. And what’s below the surface. It’s not an easy road as it takes me places I don’t understand, sometimes makes me feel like many things don’t make sense or I am worried I’m not going where I’m supposed to. But I’m trusting that as we head toward Fish Stick Wednesday, that God and I are going on a big writing adventure that will take us to Easter and beyond. While I’m not sure exactly when it began, I do know that since I was six years old, I wanted to write books. And I also know that I have believed at least since then that there were infinite and bigger doors to open in my life, that what my future might have looked like from the outside wasn’t what it was supposed to be. Often, during mass homilies, I hear the priests say how people should ask God to be who they are supposed to be, to bigger than they are, and I actually find this baffling because I thought that life was about being more than what appears right in front of us. I honestly thought that’s what everyone wanted. While I see that many people either fear being more than they are supposed to be, or they just don’t realize that they can ask for it, I also know how hard embracing that journey can be because the reality is in life that we have to make choices, that we can’t do everything we want to or thing we need to. I was lucky to grow up in a nice, upper middle class suburb outside Chicago. It was very family oriented and I always felt that people were supportive of whatever dreams and goals I had. But the life there wasn’t one I saw for myself. I tried. I bought a house back there and attempted to live back there. During that time I realized though, it wasn’t me. It was my past, but it wasn’t my future. While part of me mourns it wasn’t the life I was supposed to have, I see that if I had stayed, there are many bigger doors– the very ones I want to keep opening– that wouldn’t have opened (or won’t open in the future). No matter what we choose in life, no matter where we go, we have to let go of something (or someone). Embracing the bigger journey doesn’t mean it’s the easiest or most obvious road traveled. But it’s certainly the one most worth it. At 2:00 am on Valentine’s Day morning, my shoulder popped out– a subflexation, meaning a partial dislocation. I woke up Greg to help ease it back where it needed to be, wished him a happy Valentine’s Day, and we both went back to sleep. It had been a while since I’d had a day where I could say that while I had a lot I wanted to accomplish that day, but when I got up at 4:30 am, I was ready to take on Thursday and my list. However, just after 7:00 am, my day was thrown out the window when Greg texted me to tell me that they had been evacuated from the high school where he teaches for an– at that point– unknown reason. Turns out there had been gunfire just a floor below and down the hall from him. No one was hurt, half the students hadn’t even arrived at school yet because the busses were still on their way to the school, the shooter (and the gun) was caught, and one would think life would go on as it was. I know this feeling well– of believing I have this smooth day ahead only to have it interrupted by a life-changing phone call– or the presence of the priest at a classroom door in college. I know how quickly life can change and it’s a conversation I’ve had with Greg many times, knowing full well that this day would come that there would be a shooting at his school. Sadly, it’s reality in this times that we live in and we’ve been lucky here in Albuquerque and the surrounding area to have not had this happen before. We are lucky no one was hurt, I am grateful for that. But what people don’t realize is that in the back of my mind, it’s hard not to picture the worst. That worst is being the one left behind to pick up the pieces. For the rest of the day and into Friday morning I felt rattled. I didn’t feel like myself, feeling depressed. An estate sale and a swim at the gym pool in the warm sunshine brought my spirit back. Still, it lingers – as it always will– in the back of my mind. If there is one thing I learned from the events of Thursday, it’s that you don’t truly understand what it’s like to be faced with this until it hits close to home, meaning it affects your world in a close and personal way. Life didn’t stop because of this– nor will it. We had houseguests arriving that night for the Mt. Taylor Quadrathlon Saturday. We don’t walk around living in fear, we don’t stop doing anything because of what happens. But deep in the back of my mind the rattle sometimes comes out. Part of my daily life is learning to quiet that rattle by doing what makes me happy, what makes me feel alive, and reminding myself not to live in fear, that all is well. Lately, I’ve been thinking a lot about the whole concept of sharing on social media. I enjoy sharing what I’ve created and I often hear from people who tell me they like to see what I’ve made. But it’s also easy to get caught up in the number of likes and comments, and of being disappointed when I thought I had something really fun to share. But yet it doesn’t get many likes. So I took a little trip back in my memory of what life was like before I had social media to share my creations. And that reminded me of Bonnie. Bonnie was my neighbor several houses ago and I often joked that we bonded at the sewing machine at night making quilts and assorted other things– nautical rope wreaths (we twisted my then-husband Joe to bring us rope back from a trip to Portland, Maine, where a company he sold for was based), potpourri, pillow covers, and quilts. I always went over to Bonnie and Greg’s house in the evening, after dinner and first up was show and tell. With a cigarette in one hand, she’d have a stack of magazines and catalogs she had read and pages marked with something to show me (and C-Span playing on the television). Then we would venture into the large craft room at the back of the house behind the kitchen where she’d show me something she had made the previous week or had started a project we agreed to work on. I would bring anything I had done– although I was teaching high school at the time and didn’t have as much time as she did to create. This was how I shared, or through emailing photos to people in my life or having a party at my house where people enjoyed seeing whatever it was that was new since their last visit. 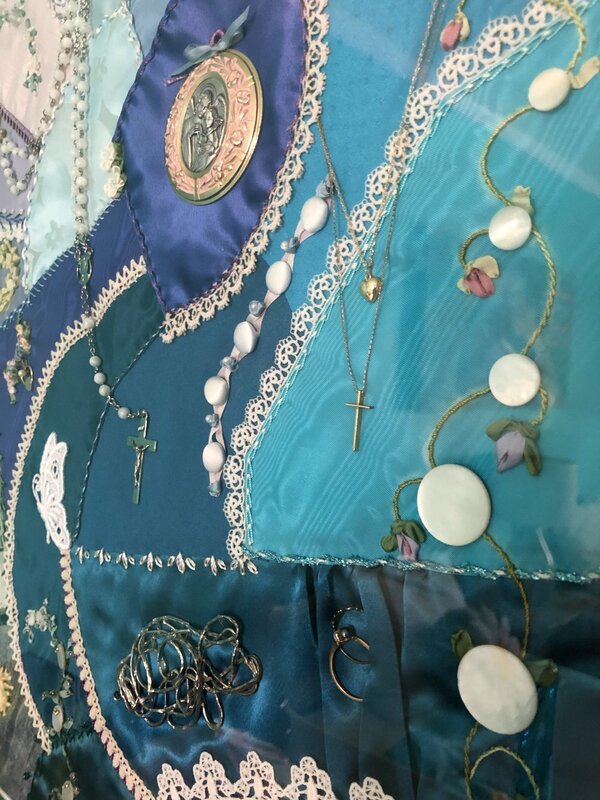 The photo above is a portion of something she made for me, taking “things” from my life and attaching them to a crazy quilt, and, finally, framing it. It’s hung in one of the guest rooms in my house since she made it for me nearly twenty years ago. But mostly creating was about my making my inner self happy– the intrinsic value. It was about what was inside, about making something, finishing it, standing up and holding it out and saying, “Yes, I like that.” That feeling of accomplishment inside me. I’m very grateful that I can share whatever I’ve made to a larger audience. However, I always remind myself that it’s about how it makes me feel inside. I don’t ever want to forget the feeling of accomplishment for myself that has long driven me to where I am today. From the outside when Greg and I met– introduced by a mutual friend, Jim– it looked like it all came together simply one day. However, I know what a long road it was to get to that September day when Jim texted me and told me he wanted to introduce to me to a mutual friend. As we have entered February, the time when we are surrounded by red and pink hearts and notions that love only seems to happen around this time, I have recently talked with or seen on Facebook the pain some friends have had on the dating scene. I used it for that and to make myself better. It wasn’t about what had happened in the past, it was about making sure the future took me where I wanted to go. It wasn’t an easy journey– I felt as if I was trudging through mud for most of it– but it was worth it. While physically I kept running and walking, giving the dogs walks twice a day, I was going to have to do more than that if I wanted that right person to enter my life. I somehow found a book by a therapist about how to find your right mate. Honestly, I have no idea the title or who I gave it to because once I was done with it, I passed it along. But there was one major aspect I took from the book and it’s what you see in the photo above: a written intention, a mantra of sorts. While I didn’t realize it until about ten years ago, I have often called the journals I’ve kept since eighth grade letters to God. Writing has always been a release and I had never thought about it as something more until one day I realized that they had been my prayers all along, even during times in my life when I wasn’t consciously praying to God. That book reaffirmed that by writing my intention down, I could make it happen. It’s as if I released it to the universe when I put it on paper. It wasn’t just that though– I worked through lots of challenges and made sure I was the best Michelle possible– at least for that time because I believe Greg has made me a better Michelle and then surgery last year changed me again. But at the time I was the best Michelle I could be for Greg to enter my life and for us then to take both our lives separately and together forward, making each other even better than we were when we started the journey together. There was no question when Greg and I met. We moved forward as if we had met on a long walk along the ocean and kept going. Still walking today. We began to weave our lives together and help each other become better people. It made me realize that after trying to make what had become a bad marriage work and then a relationship following the marriage that I thought I could make work, that it didn’t have to be that way. Life is too short to be more difficult than it is. I found someone who made my life easier, who helps me be the best I can be, who clears the path (as I do the same for him) so that I can be better. My life partner. Choose your intention. Take care of yourself. Go on with your life. The rest will take care of itself. The right love will find its way to you. On Friday, it will be eight months since I had my uterus removed. In many ways the surgery feels like years ago, mostly because life has gone on since it was taken out. And once I got through the nasty mess that anesthesia left me in, my recovery was very quick. However, because I take so few days off from running (ever! ), one of my challenges was starting to run again. Without walking. I was cleared to run several weeks after the surgery and the day I could start running we were actually heading home from Los Angeles (at the end of June). We try to leave the LA area earlier– not just so we get home earlier, but also to get out before the morning commute takes over– and it was dark when I went out for a three-mile walk. I tried to run a few steps here and there, but I was quickly aware this was going to take more time and effort than I had realized. It wasn’t until after Labor Day that I could finally run my entire route here at home in Albuquerque without stopping. While at the beginning I definitely felt a tightness in the area where my body was still adjusting to life post-uterus, it turned into a head game for me. I just couldn’t quite get my head together to keep running. As weak as I felt, I knew that I could overcome it because I’ve been running long enough to know that much of it is a head game. However, there was another factor I didn’t take into consideration. Summer had gone on, mostly quietly, and each afternoon I went for a 20-minute swim once we had arrived home from that Los Angeles trip. It wasn’t until late September that I realized that I swam everyday since since we’d arrived home. Running and swimming aren’t friends (add a bike trip between them and that’s another story– there is a reason triathlons are so challenging!). While running has always been my main workout, the swim was more about meditation and letting my mind wander late in the day. I kept swimming, even as the nights cooled which also brought the pool water temperature down, not wanting my streak to end. By then I finally was running my entire route again, but it was a struggle. Not a fun one either. When we hit December I started to feel strong again. It was then that I realized that finally those two workouts had come together to not just help me regain my pre-surgery strength, but make me stronger than I was before. I learned a long time ago that often we push the hardest when we are sick or coping with some other physical (or mental) challenge because we have to compensate for whatever else is happening. I didn’t realize I had been doing just that, making myself stronger in the presence of a challenge. If we trudge along long enough, one day the break comes and see that we really have come a long way. Somewhere around the time I turned thirteen, my goal was to move to California, Los Angeles, specifically. And somewhere along that line, the dream didn’t shatter so much as other events in life happened and I found myself taking other roads, including one road that led me to Albuquerque. It’s like I put the dream down and left it on my desk, covered by everything else that seemed more pressing in my life. That dream makes me think of my eighty-something neighbor across the street who told me how she and her then-husband were bound for Los Angeles from Kansas in the 1950s when the baby got sick and they had to stop in Albuquerque where a lack of funds forced them to stay here. I often joke that, too, I was bound for Los Angeles, but somehow I didn’t quite make it that far. Then around 2008, life began to take me back to Los Angeles and slowly the dream emerged again, as if I was cleaning off my desk and found it. By then something about the dream changed when Sam and Lois Bloom entered my life. They kept inviting me to stay with them in Palos Verdes and on my second visit when Lois turned her head back in the car and said, “Sure you can rent a surfboard. Why not?” – a moment that seemed insignificant at the time– was a turning point in making the dream come true. No, I don’t live in Los Angeles now, nor do I ever plan to live there full time. However, because of the Blooms– and a husband who has enjoyed getting to know a new city– Los Angeles is my second home in many ways. Slowly, we have built a portion of our life there and we’ll continue to do so. What I see in the rearview is how my parents took me on a journey of my life– in the Chicago area– but one that I have become disconnected from in many ways because of Los Angeles. It’s not bad, it’s about me moving forward, about being the person I’m supposed to be. I wouldn’t be who I am without the Midwest, Chicago, Naperville, but the dreams of Los Angeles kept me going through miserable snow and dark winters, knowing that there was something else out there for me. I sometimes think of my sister Denise and the Blooms’ son Sammy– who died by suicide in the early 1980s– getting together in heaven and plotting getting me to Los Angeles. Then my dad died and he joined the conversation, followed by my mom just three weeks before Greg and I made our first trip there together. It’s as if my parents were there for a portion of my life and now the Blooms are what I call my “California parents” because I know without them, I wouldn’t have been able to explore and made the area feel as much like home as I have. I wouldn’t be able to tell you the exact reasons why life drew me there at age thirteen, but I see now that I was following a path that I allowed to unfold in front of me– maybe not as I expected or as quickly as I wanted– but one that was meant to be, a dream that I kept alive in some way. At a spiritual direction meeting last year, Fr. Gene told me– and I don’t remember what we were discussing- how he had once been told that after he gives a homily, he has no say over what someone chooses to do with it. He’s thrown it in the air and who catches and what they do with it isn’t his business. Steve Mazzarella threw much in the air– of kindness, knowledge, and inspiration– and it was caught by many more people than I’m sure he ever knew. After I found out he died early Sunday morning from a malignant brain tumor and I watched the comments begin to flow through Facebook, I thought about how my experience with him had been much different than many people. I wasn’t in Snowball nor was I a diver. But I sat front and center (surely not my choice– I have no idea how I ended up there) for his health class sophomore year of high school. And it was there that he left a lasting impression on me. That impression, however, wasn’t immediately obvious because it wasn’t until after my sister’s death that much of what Mazz taught me came rolling back in the form of my own life as I completed a masters of education and then became a high school health myself. I still use the 50 goals we wrote out as an activity when I do workshops, making many people groan at the idea. For me, the idea of putting my goals on paper is much like a prayer or planting seeds in the spring the garden. It’s a place for them to start and it was Mazz who taught me that. Somewhere along the line we got back in touch and before I moved back to Albuquerque in March 2013, he asked me to come speak to his advanced health classes. He had wanted me to talk about suicide to the regular health classes, however, because I was leaving, it wasn’t going to fit the schedule. Instead, he asked me to reflect on my journey to these two groups of students who were near graduation and stepping into the next phase of their lives. It wouldn’t be our last communication, but it would be my last trip to my high school and the further I get from it, the more I see that it put some ghosts of my past to rest. I have recently been thinking how that year and a half in hometown allowed me to let go and move on from so much that I had left sitting in the darkness of my memory (all relating to finding my way in the world and coping with my younger sister’s suicide). By finally sweeping the out of the darkness and out of my life, I could truly move forward in my life. Mazz’s influence on my life was on the periphery, but it was important to who I am today. He gave me many ideas and one big opportunity that helped me find my way to who I am now..
His life wasn’t as long as it should have been (are they ever? ), but in that short time he inspired so many. Including me. It always seems perfect. And then turns complicated. It was the perfect fabric. I was looking for a specific weight for a dress I wanted to make. With the amount of chiffon and georgette one can find in the Los Angeles Fashion District, this would have been a cinch. And I thought it was when I saw it. It was paisley, it was pink. It was orange. It was green. It was yellow. It was the 1970s. It was my Barbies. We asked the woman working in the store what the price per yard was, $1.80. I was cool with that. The minimum? I expected her to say five or ten yards, what we’d be quoted at the stores on the block next to this one. I’m not there yet and knew it, leaving the store with a sample in my hand, but feeling dejected, not wanting to let this pattern slip through my fingers. I thought it was stupid to ask him if I should buy the fabric. I didn’t need that much, I didn’t need to focus on it. I would let it go and eventually it would come back when the time was right, maybe in another form. When that happened, I’d look into the rearview mirror and understand why it transpired the way that it did. I let it go, we parked the car, and walked toward the store where I needed to get piping for pillows and I looked down. A penny. The fashion district is filled with homeless; we walk by more makeshift tents than I can count with all my hands and toes put together. There’s never a coin to be found. Except this one. That’s where it got complicated. The woman kept upping the minimum on the rolls from 50 yards to 60 to 70. I definitely didn’t need that much fabric (but curtains were starting to sound good). She also couldn’t get to the rolls because there were too many on top of them (they’d used a forklift earlier that morning in another store to get to the pink lining that I’d requested). She would have to wait about an hour for some of the delivery guys to come back and help her. We left the store with plans to drive another store that was a few miles away, me knowing it might kill enough enough time. I’d already come this far, I was going to get the fabric now. Three blocks away, the woman called. “I don’t know how it happened but I found a roll with 32 yards on it,” she said. Still more than I needed (at least until I make the first dress), but more manageable. And definitely meant to be mine. I’ve put off writing this blog and it’s been easy with the holiday hustle and bustle. I’ve felt like I’ve been chasing myself and now as things start to wind down, at least through the new year before they wind up again, I know that I need to write this because life is going to change again soon. I’ve made it a tradition– although I don’t think that’s a good word– to write about each of my dogs after they have died and while Carson was only with us for the end of his life, he deserves a blog, too. I miss him. I miss his presence. I find myself grabbing three treats from the cactus cookie jar where I keep them rather than two. The house is quieter. Lilly needs someone to at least pretend to chase her around the yard and Hattie wishes Lilly had someone to chase her around so she would leave her alone and quit being the annoying little sister. But this is what I remind myself– Carson is happy now, he is out of his pain. The last month of his life was trying for all of us and I’ll admit it was a strain on our relationship. Carson had lost control of his bladder and my days were spent changing his wrap (fancy word for diaper), sometimes him running from me after I had let him outside, but needed to put it back on before he returned inside. At 4:00 am the day before we put him down, he stood at the far end of the yard and we had a staring contest, me refusing to go any further outside in my bare feet and thirty-some degree temperatures. I won the contest only after I shut the door and pretended to walk away– inside the house. I felt as if Hattie and Lilly missed out on attention because most of my time was going to Carson. I started to find Lilly sleeping upstairs by herself, a place she never went unless someone was with her. The strain took its toll, but I still struggled with actually putting him down two weeks ago today. He had a zest for life and I didn’t want to put him down too early. But I also didn’t want to keep him around too long because it wasn’t about us. It was about releasing him from his pain. Two weeks later, I now remind myself in my sadness that he’s happy now, he’s met my family and all the dogs that have gone before him. After what appeared to have been a challenging life, he found happiness with us, so much so that he defied the expectations of his lifespan and may have been seventeen when he died. He’s out of pain and anything that happened to him that left him fearful here in his life melted away as he went to sleep with that sedative and drifted into his new life. His new life of love. I told Greg that I’m going to make prickly pear hard candy until the cows come home, partly because we have so much puree and partly because it feels like something unique and special that I can share with everyone. Yet it took me by surprise last week when I dropped off a bag to two Native American friends and he told me what a special and meaningful gift it is. He and his wife grew up eating prickly pears near the Gallup area where they were raised. It also surprised me how happy they were to taste the candy, telling me it was a taste from their childhood, and one they hadn’t had in a long time. I was so excited as I left their business (where I drop off my packages for shipping), knowing I had given them a treat, a piece of their childhood, something that left them in awe. As I drove home, I thought about how this is what the Christmas season is about. It’s about doing something meaningful for others, about making the season special by making something for others. The holiday season goes fast, but we can fill it with joy by giving to others. And thus filling ourselves with joy. As I spend much of my time working on moving forward, what I don’t do often is reflect on where I’ve been. But because I keynoted several conferences over the past six weeks– and I was speaking about how I’ve gone forward in my life despite my many losses which was a new talk for me– I had to take the time to think about how I’ve gotten where I am to create my talks. Sometimes I share the aspects of my life that inspire me, yet I’ve also realized that I might not be reflecting fully on them and that’s what happened over the month prior to speaking. Since I was six years old, I knew I wanted to be a writer. Not just a writer, but an author. I wanted to tell stories. I don’t think I knew what those stories were going to be beyond the picture books I made with Raggedy Ann and Andy starring, but it was my dream to have my name on the side of a book. That dream stayed alive for most of my childhood and teen years except for several side roads I veered down, testing other waters. But the roads always took me back to writing. What I see now is that many times I took those side roads to learn something I needed to write about. Even today when I find myself deeply interested in a topic and wonder why I didn’t pursue it before, I realize that somewhere it might fit into a story. When my sister died in 1993, at least in the memories I have now, I don’t remember that the writing dream died. I believe it remained an ember– an ember that all of us have as I written previously about hope– because it wasn’t going to die. I had a road to travel and eventually I would make my way back to it. I also believe that that dream is what has kept me going all these years. While I make handbags and clothes and do all sorts of other things, it is when I am writing that I truly feel I am doing what I’m supposed to be doing. The stories, the people, their lives, are with me constantly and many days keep me motivated around frustrations and the routine of life. The hard part is that the dream hasn’t manifested itself yet as want it to. Yes, I have written multiple books, but I’m not where I want to be, on the bestseller list– yet. That ember keeps burning and I keep writing, knowing that somewhere along the way the flame will spark and suddenly the fire will take off. I had two major goals for October: one to continue my goal of swimming every day between July 1 and November 1. This wasn’t something I set out to do so much as I realized in September that I had been swimming every day, not on purpose, it had just happened. So I thought, why not keeping it going as long as I can? I am happy to say that despite the cooler weather, I have managed to keep swimming past November 1. But I also wanted to have a 100-page writing month. I managed to finish that one early although about halfway through the month I found myself gravitating toward the kitchen, wanting to use new recipes, make new dishes. And make these jam bars pictured above. As I was doing it, I figured out why: I’ve been so engrossed in one big goal that I could feel myself needing a sense of accomplishment of finishing something small, something easier. Manuscripts take a long time to complete and this current one is going to take me well into next year. That means I need to find smaller goals I can accomplish in the meantime. That’s where much of my creating comes into play. I can have something completed after a few hours or less and suddenly the antsy dissipates as I see what it is that I’ve created. It allows me to keep working on the manuscript, yet gives me the instant reward of having done something else. Our lives are filled with big goals and if we want to keep ourselves motivated, the best way to do that is to balance them with little goals. After all, life is about balance so why shouldn’t it be the same with goal setting? Michelle's books are available for purchase.